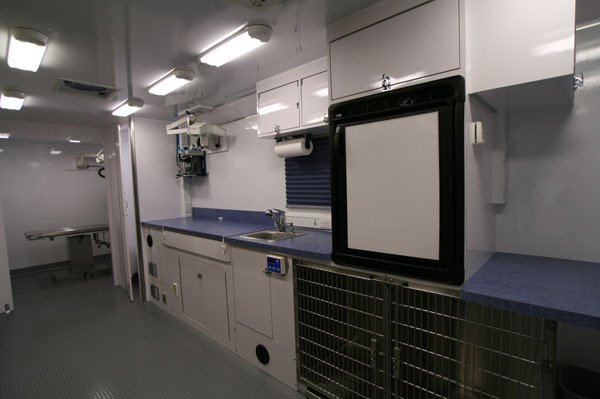 Many types of La Boit Specialty Vehicles are built using grant funds, with the most frequent types being Mobile Spay/Neuter/Adoption Clinics, Mobile Medical Clinics, and Mobile Command Centers. Grant dollars for medical and command vehicles most often come from the federal or state government, in which the mobile unit will serve a specific public interest that is otherwise not being met, such as medical access in rural communities, or rapid response police communication vehicles in high-density urban areas. Columbus, OH – Gil Blais, President and CEO of Gahanna-based La Boit Specialty Vehicles Inc., has personally commissioned a vehicle that will serve as a mobile billboard for a cause he says he feels very passionate about, the safety of police officers. Blais, a self-made millionaire and ex-marine, first started La Boit in the early 1980s as a manufacturer of vehicle inserts for veterinarians. Since then, the business has grown into a manufacturer of custom-built specialty vehicles for a variety of industries, including veterinary, medical, and law enforcement. For La Boit Specialty Vehicles, it is important for us to stay up-to-date on the latest in the commercial truck industry. We make it a priority to know the newest techniques in manufacturing as well as changes in market trends and government regulations. For the past ten years, La Boit Specialty Vehicles has been a member of the National Truck Equipment Association (NTEA). Many of La Boit’s clients are non-profit organizations – from blood donation organizations and non-profit hospital systems to humane societies and low-cost spay/neuter clinics. As a result, they rely heavily on donations from individuals and businesses to cover the cost of their mobile clinic purchase, as well as their day-to-day operating expenses. We recently came across an article in Business Fleet Magazine titled “Running Trucks Till the ‘Wheels Fall Off’ is Expensive and Counter-Productive.” While the article is a couple years old already, its still a timely and important message for owners of specialty vehicles: running a truck until it has nothing left to give usually ends up costing more.